Will China's new food safety rules work? The harvest has come early to a small organic farm just outside Beijing. Workers can only manage a brief smile and a glance upwards as they place vegetables into boxes bound for market. Standing in the background is Liu Yujing. She sticks out as the only one not covered in dirt. That's because she's just here to watch. She runs an organics delivery business that buys vegetables from this farm and others. Ms Liu started her company with other concerned parents, not for profit, but out of fear. "In the very beginning, I just wanted to find safe food for my daughter," she explains. "Other mums and I read books on food safety issues. We realised how serious the problems were and decided to do something ourselves." Ms Liu admits that her delivery service, the Green League, has fought an uphill battle to find farmers willing to use organic methods. And also, to locate customers willing to pay more for clean food. "When we started in 2010, many consumers didn't know what organic meant," Ms Liu explains. "They asked me, is organic a type of chemical? Now, they know. More and more people are promoting this concept." 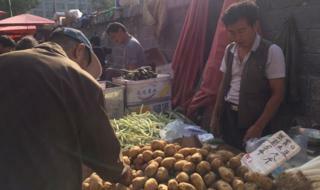 Not everyone in China can afford to source their own relatively expensive organic vegetables. Many depend on the government to fix the growing food safety problem. Fake rice made of plastic pellets, imitation eggs made out of gelatine, and decades-old frozen meat destined for market - China has had more than its fair share of food scandals in recent years. The most jarring - infant formula tainted with the industrial chemical melamine. In 2008, it caused babies' kidneys to malfunction - killing six infants and hospitalising 300,000 others. A recent poll from the Pew Research Center reveals that concerns over food safety have tripled in China since the milk crisis of 2008. More than a third of people believe persistent safety issues with the country's food is a "very big problem". Now a sweeping new law is meant to clean up China's entire food supply - banning highly toxic pesticides, regulating food labelling and, importantly, increasing punishments for those who violate China's existing laws. There's a new burden of responsibility placed on everyone who handles food - from farms and fields to restaurants and food stalls. There are hopes the new law can rebuild people's trust in Chinese-made food. But many are sceptical the safety law will lead to a quick fix. "It's a stricter, more extensive law and I think it will bring some changes," says Yao Bo, a popular online commentator who often writes about food safety issues. "But China is a huge country with a large number of farmers so enforcement will be hard. Following the food chain from start to end is nearly impossible. Progress is going to be very slow, and we have a long way to go." Mr Bo explains that land in China can't be privatised, so it is difficult for individuals or companies to build up large plots of land. That means that farming is still quite piecemeal, making it difficult for the government to track. "We welcome this new law, but I am not optimistic it will be enforced," says Yu Fangqiang, founder and executive director of Justice for All, a policy advocacy NGO in China. Image caption The law says food producers and sellers will come under "very strict supervision"
"It seems that the legislators are trying to write a law just to please the Communist Party leaders. For example, the law states it will establish 'a very strict supervision system', which isn't a formal or legal term." At an outdoor restaurant in Beijing, lunch goers are also pessimistic that the law will change China's food system. One chef is vigorously stirring a large portion of fried vegetables. Next to her, another woman spoons raw pork into dumpling wrappers. Flies buzz around the food and no one bothers to sweep them away. Customer after customer had few positive things to say when asked about food safety in China. "The food here is obviously unhygienic, but I have no other choice but to buy it," shrugs one young woman. She questions whether the law will change anything. "The government and businesses both have a responsibility to take care of food safety. But the government doesn't always enforce the regulations." Over speedy bowls of noodles and rice, there's an air of resignation among the lunch crowd here. Despite the government's good intentions, the hungry crowds here feel that China's complicated food problems won't disappear in a hurry.